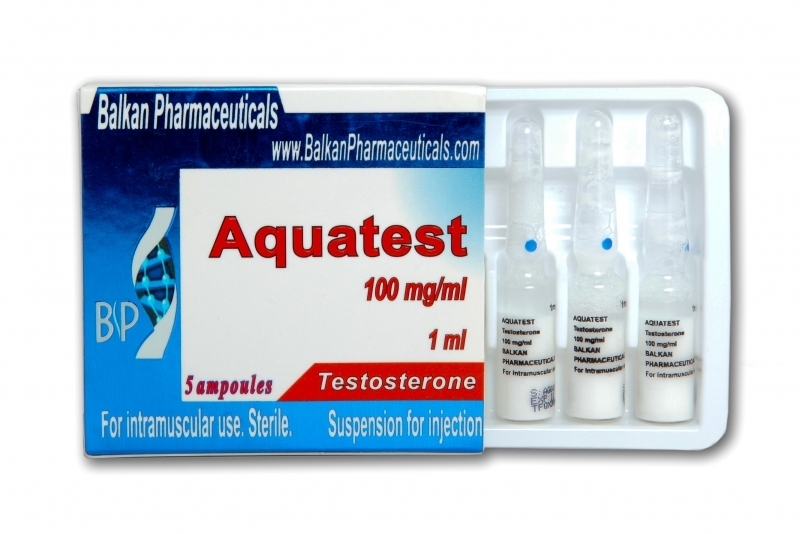 Aquatest (testosterone suspension) is an absolutely new product that was initially developed by Balkan Pharmaceuticals Company. This testosterone has a strong androgenic effect and less expressed anabolic one. Aquatest represents a liquid of white color, as for the chemical composition – water suspension of pure testosterone. From the words of its developers, this is the way to protect testosterone molecule from decay and avoid the destroying effect to the liver. Testosterone comes to blood without any changes, it can be said that Aquatest contains free active testosterone. This makes it different from its brothers of oil esters of testosterone: enanthate, propionate, cypionate. This feature of given testosterone is very interesting for experienced athletes in order to decrease the damage of steroid course where the doses are not small. Because of Aquatest being water suspension of testosterone, that is why the injections of this drug should be executed more often than those of oil-based testosterone. The course duration that is enough to achieve the necessary result is 6-8 weeks. It is useful to combine Aquatest (testosterone suspension) with Danabol, Stanabol, Nandrolone, Primobol. As for the side effects of this testosterone, we can note the increased blood pressure, heartbeat, body ruptures, hair loss, and increased hair growth on the body, sexual hyperstimulation, and increased aggressiveness. Antiestrogen drugs like Provimed, Clomed and Tamoximed can prevent these cases.